Been a while since we have had any clotology on here. That is unacceptable. So here we go with another journal club fest on the management of acute VTE. Now we have improved access to whole leg compression ultrasound, some reliable safety data around the use of this technology and a specialist society for vascular sonographers it is not surprising that we are picking up more and more small clots in an ED setting. Here in both east and west Virchester, we can add to this number an increased rate of confirmed superficial vein thrombosis (SVT), or thrombophlebitis by its old name. Not a bad thing really, when you consider that unprovoked thrombophlebitis can herald fairly nasty thromboembolic disease, or sometimes even malignancy. These clots often extend far more proximal than their symptomatic margin, and sonographic confirmation and characterisation can be useful to guide treatment decisions. There is evidence (from the STENOX 1 and CALISTO 2 trials) to suggest that treatment of these clots can lead to a reasonable reduction in serious event rates. An alumnus of virchester has also recently looked at the management of superficial vein thrombosis for her FRCEM clinical topic review. Pretty convincing data to treat these patients with prophylactic dose anticoagulation really. This evidence is supported by BMJ best practice and ACCP guidelines, that offer risk stratification criteria so you can perhaps select out those likely to result in higher risk and concentrate on advising those patients carefully regarding treatment options. However, the current evidence base is for fondaparinux treatment and 6 weeks of injections can be a real (and literal) pain. If patients are reluctant to self inject, then it also can come at considerable cost and nursing resource. One wonders if there is another way…. So, this trial, the oddly named SURPRISE trial3, is quite the opposite of FOAM. It is a 2017 study in a high impact journal with a fairly robust firewall, preventing access of the full text to even the likes of me with NHS Athens, local trust and red brick University credentials. However, I have paid my interlibrary loan fees for this one as it’s right up my street and I wanted to see the detail. After reading this, I suggest you do to if you are interested – nothing beats generating your own opinion after reading the facts. 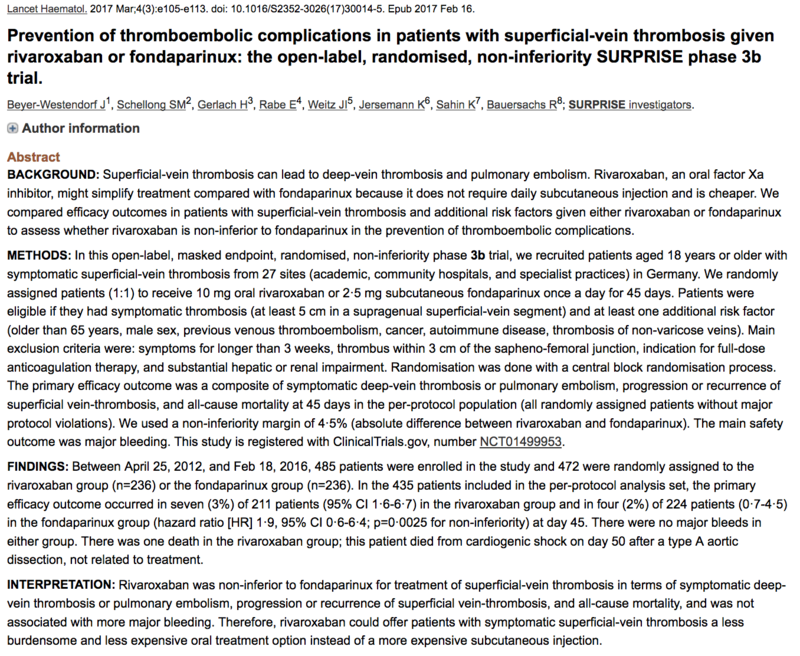 This is a randomised controlled non inferiority study recruiting 472 adult patients across 27 sites with symptomatic superficial vein thrombosis to receive either 2.5mg subcutaneous fondaparinux OR 10mg oral rivaroxaban once daily for 45 days. They included patients with at least 1 additional factor for propagation and where the thrombus was at least 5cm in length. They excluded patients who had thrombi within 3cm of the saphenofemoral junction, those who had symptoms >3 weeks, other indications for full dose anticoagulation, or other exclusions to anticoagulation in general. The primary efficacy outcome was a composite (sharp intake of breath) including subsequent diagnosis of DVT, PE, death and progression or recurrence of superficial vein thrombosis. The latter aspect of the composite raises an eyebrow – we will touch on that later. I see – what’s the hypothesis here then? Well, simply that oral prophylactic dose anticoagulation may acheive the same risk reduction for these patients regarding progression of venous thromboembolism, but be less of a pain in the arse. Hmm. And what’s a phase 3b trial again? That refers to a trial launched after a new drug approval regulatory submission has been launched, but prior to the medicines formal approval for this indication. I suspect the authors have labelled it in this manner because there is a pending submission for extension of license for this indication. They already have much of the necessary information from previous trials of this drug on orthopaedic surgery patients. Here is an overview of trial phases for those keen to know more. Right. You haven’t mentioned blinding. Is that on purpose? Sort of. This was an open label trial. The authors could have designed this study so that all patients received injections and tablets, either sham or intervention. They chose not to do this, and instead focussed on trying to reduce the impact of open label study by objectively confirmed endpoints, prespecified outcome definitions and masked, independent adjudication of outcomes. This is laudable, but does leave some questions regarding ascertainment bias. Although the adjudication committee were masked, they will undoubtedly have based their adjudication decisions on the results of imaging. The results of imaging can include a degree of subjectivity. The operators of the imaging were unblinded. Therefore conscious or unconscious bias could have still affected their decision making and reporting. Right. I feel uneasy. Was this a commercial trial? Yes it was. By Bayer, who manufacture rivaroxaban. The lead author also discloses interests including research support and honoraria from Bayer, in addition to other companies. This is transparent and appropriate. Important for you to know, though. Right. Anything else to say about the methods? Well, non inferiority deserves a bit of a mention. Essentially, there are 3 types of randomised controlled trial design – superiority, non inferiority and equivalence. Superiority trials aim to determine a clinically relevant difference between 2 interventions. This is the classic RCT design. Studies that show no difference here are often misinterpreted as demonstrating equivalence, when actually this is not true – negative superiority studies only suggest that the authors have failed to detect a difference between interventions. This is not the same as suggesting they are equivalent. Equivalence trials aim to determine if a new intervention is neither worse, nor better than an established treatment. There is rarely a need for this in clinical medicine, and usually this trial design is restricted to preliminary dose finding pharma studies. However, Non-inferiority studies are very useful in modern medicine. These trials aim to determine whether a new intervention is not inferior to an established intervention. These trials are used often when new interventions have an obvious advantage – in this case the absence of needles. If it can be shown that this new intervention is no worse than the current strategy, the argument for use is immediately established, even without evidence of clinical benefit. This is the chosen design for most DOAC studies when comparing to standard care. What does ‘non-inferior’ actually mean? Usually the authors will set margins for what they consider to be non-inferior. In this study the authors guessed that with treatment in their cohort, the risk of a composite outcome would be around 3%. Using estimates from other studies, they calculated that a worst case difference between fondaparinux and rivaroxaban would be around 4.5%. They then suggest that they would consider the new intervention to be non inferior if the upper limit of the 95% Confidence interval for risk difference between the groups, would be below the cumulative figure of 7.5% (3% baseline, added to 4.5% worst difference). This is the correct way of doing things, but as you can see a lot rests on the estimates of worst difference initially. Here, they accept that as long as rivaroxaban can confidently display an event rate of <7.5%, it is not inferior to fondaparinux. An event rate of 7.5% is actually quite high, and if the fondaparinux event rate is genuinely around 3% this could be double the baseline event rate. Or in other words, they would accept rivaroxaban as non-inferior provided they could be sure it did no more than just about double the outcome rate. Doesn’t look quite so convincing when you write it down like that. But like all things with stats, this is about numbers. The larger your non-inferiority margin, the less patients you need to power your trial. They calculated a need for 460 from these figures. This is quite an interesting FOAM summary if you want to dive deeper into all this. OK. What about the results? 485 were enrolled, 472 randomised and 435 analysed per protocol. This is not bad, but a per protocol analysis is particularly important for non-inferiority studies which we should remember. Baseline characteristics were evenly spread apart from gender, with 5% more men in the rivaroxaban group; you can imply that these men might be at worse risk for an adverse outcome/recurrence based on other recurrence work. The primary efficacy outcome at 45 days occurred in 3% (95% CI 1.6 to 6.7) of the rivaroxaban patients, and 2% of the fondaparinux patients. Thus the Hazard ratio for events with rivaroxaban was 1.9 (95% CI 0.6 to 6.4, p+0.0025 for no inferiority). By 90 days this primary outcome was even between the groups with a 7% event rate in each and a HR of 1.1. Thus, the respecified margins for non-inferiority were achieved, and this was the case in the per protocol analysis also. I see – an open and shut success? Lots of good stuff here and yes, quite convincing. There is a bit to unpick however – when you break down the composite outcome, you will see that no patients had a PE, no patients died and there were 3 times more proximal DVT in the rivaroxaban group. Most of the outcomes were actually only SVT recurrence, which is arguably of less interest to clinicians. This was still the case at 90 days, despite further events occurring. Bleeding is always interesting in these trials – No major bleeds (as per ISTH definition). Six times the amount of clinically relevant non major bleeding in the rivaroxaban group. Similar rates of minor bleeding. Does that represent the open label design? People using the new tablets were more aware of bleeding risk and therefore more likely to attend for review? 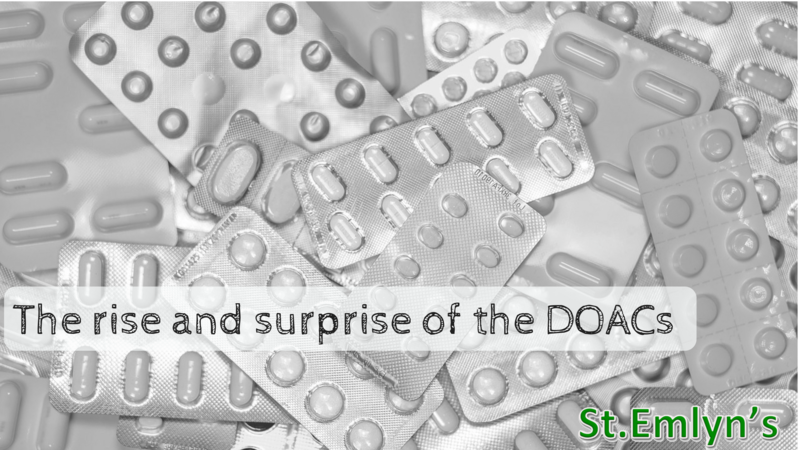 How often do you go through bleeding risks with your patients when prescribing any level of anticoagulant? Interesting food for thought. They did not achieve their expected event rate in the control (fondaparinux arm) which limits the statistical power of their study. However, they allude to this in the limitations. They also highlight concerns about generalisability which are worth touching on here – this is a german cohort of patients with clearly defined risk factors for extension of disease. As such these findings cannot be applied to low risk patients, and the merits of application to cohorts outside Europe is debatable. In addition, even in this high risk group the event rate for serious VTE with prophylaxis was low. Does this raise questions about whether any therapy is needed? How convinced are you about the need for treatment here? There is also no cost effectiveness data here, and no attempt to balance the discussion regarding risk and benefit. Essentially, while patients may prefer the idea of a tablet, this therapy seems to carry a slightly higher (but non inferior) risk of thrombotic complications, a higher rate of clinically relevant non major bleeding and may be more expensive. I think shared decision making discussions should probably factor in these points where feasible. Well, I caught up with the lead author of this paper at #VTEDUBLIN2017 Jan gave a great talk on the trial and a magic ‘how I treat’ synopsis about SVT. He seems to advocate for thorough ultrasound evaluation and delineation initially – this allows you to capture silent DVT and those <3cm from the saphenofemoral junction for immediate treatment. Then it appears to be a risk balance – if it is small (<5cm) or has no risk factors for extension, or there is a specific bleeding risk then compression stockings and NSAIDs would seem to be his first choice. If there are risk factor and no contraindications to bleeding, he suggests prophylactic dose fonda, rivaroxaban or LMWH. Interesting stuff around balanced decision making. I am sure there will be more to come. In the meantime keep thickslicing your patients and remember that these clots can cause significant harm, but so can over treatment. You need to think about each patient, talk to them and try to reach a sensible decision based on the empirical data we have thus far. I hope that’s helpful – for any emergency clotology I would love to hear comments, or suggestions for future posts.